Education in Chinese culture is a process of cultivation. 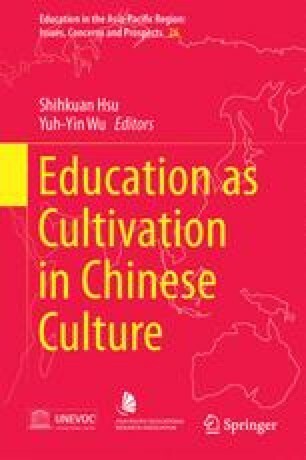 In education, cultivation is a cultural practice largely based on Confucian values. As a result of this practice, countries or regions with Chinese heritage, mostly in East Asia, have performed well in international educational assessments. International comparative education studies have found that students from these countries spend long hours in school, and they face intensive entrance examinations for senior high schools and universities. These characteristics may be traced back to beliefs in education and the orientation of Chinese culture. Research has documented the phenomena and the cultural foundations for these characteristics. There is more to be learned, however, about how Chinese culture has been influenced by ancient philosophies and how philosophical assumptions interact with people and social structures. Understanding cultural dynamics helps educators explain the roots in the past, the form of schooling in the present, and the ways education can be changed to improve it in the future. Therefore, this book elaborates on the goals and processes of education with accounts from different levels and branches of education. The concept of cultivation will be characterized in three ways. The first aspect of cultivation focuses on the whole person. The Chinese view education as cultivation of the whole person including knowledge and skill as well as morals and virtues. The second aspect of cultivation focuses on growth and development throughout life. Chinese view education as cultivating throughout a persons’ life, from the beginning to the end of life, with schooling as a part of the process. The third aspect of cultivation focuses on social structures. Chinese have many social structures that support and reinforce traditional values, such as political forces, examination systems, and social ladders. Analysis of these three aspects of cultivation, accompanied by case studies of schools, mostly in Taiwan, will provide a broader perspective on Chinese education. It will illuminate methods through which Chinese traditions can be preserved, revised, or transformed during the challenges of globalization.